You are here: Home / Ideas / Need a low profile, unobtrusive, durable label? Need a low profile, unobtrusive, durable label? Sometimes we want our labels to really stand out and be easier to find. At other times, we might want the labeling to be less noticeable, maybe for military equipment, stereo equipment, cell phones, etc. That’s where our Black Polyimide label material comes in. Winco ID’s black Polyimide (Kapton) labels provide all the performance features of our other Kapton labels. They are compliant with REACH and RoHS and are designed for use in applications where the temperature can reach up to 930F. In addition, the labels are very low profile – the Polyimide label is only 1mil thick. This also reduces the unit price. The labels are specially designed to give great print quality when printed on high resolution thermal transfer printers using white or silver resin ribbons. 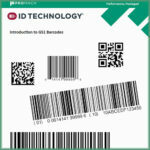 I can see this label material being useful for a number of applications, in particular UID labeling for DoD contractors. If you’d like to learn more, give me a call at 603-598-1553 x237 or just use the contact form on the site. What do you think? Do you see any need for a dark coloured Polyimide label in your industry? We have a wide range of durable labels in Kapton and other materials. How can we help you?